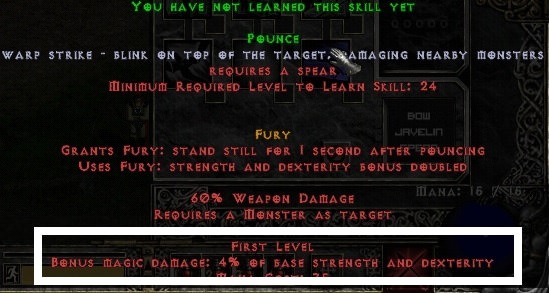 Bloodstar skill - what kind of damage ? How much per lvl ? -Its a debuff aura on enemies, meaning, mers and reanimate spelsl also benefit from it? I don't know if this has been reported already. I'm having problems with the Gidbinn quest in Terror difficulty. I haven't had any problems in Hatred: i touched the altar, and after a while the boss spawned; once dead, he dropped the quest item. This time, though, when i touch the altar, nothing happens. I've tried at least ten times, and the boss doesn't spawn, so i can't complete the quest. Should i just try to change difficulty in order to change the layout of the area? Yes, reroll the map. That should fix the bug. When i look my chars stat the dex and strange are not up after pouncing. It doubles the additional magic damage (which is based on strength and dexterity) you gain from pounce. What do you guys have against halberds? There are a few item models you just chose not to implement.. I’m just wondering why. Warren1001 wrote: I do not have an active internet connection, so I was wondering how to download the documentation for offline use. I don't see an obvious download button anywhere like there use to be, maybe I'm blind? Is there a list available you can use to check all cotw? Current patch and older patches like xvi, 2012 and even omega?